For as old as George is he is very up to date with the times, in terms of social trends in society and computer technology. I really like his use of computerized special effects. I'm the farthest from the advocate for CGI, but today some of these computers can churn out some powerful effects. What made Survival unique is how he used both natural prop effects and computer CGI. The use of the CGI was mainly applied just to gun shots and blood splatters. But torso dismemberment happened to be original using makeup and classic prosthetics. 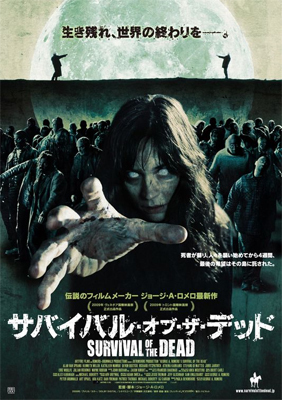 The story consists of two rival families who each believe they have the best remedy for the zombies. On one hand you have O'Flynn who is determined to kill all the dead, and on the other hand you have Seamus Muldoon who is hell bent on preserving the dead in hopes of finding a cure for them. Obviously their differing views on society cause a riff and one of them has to leave the island. Muldoon and his goons offer O'Flynn a choice of death or life if he leaves the island. O'Flynn flees Plum Island but not for long. I'm not one for spilling the beans on the plot or the story but what i find appealing is how Muldoon and company tie chains to the dead so they cant leave their homes. They try to live with the dead, remember the dead, rather then exterminating them. The film hasn't gotten good reviews, but I really enjoyed it. If you're a Romero fan you will like the movie, if you're a zombie fan you will like the movie. But critics will be critics, regardless I am recommending this movie to everyone, but then again I like bad movies...so you be the judge.